@Davey Thank you for your time and feedback to work that out. I have updated the lists. An alternate download to the allhosts file. CoinBlockerLists - Simple lists that can help prevent cryptomining in the browser or other applications. @smokingwheels I still have to whitelist android.clients.google.com for youtube to work on Android, thanks! …and I had to whitelist spclient.wg.spotify.com for Spotify. @ajp2k13 Thats confirmed and fixed for the android.clients.google.com . I was 1 out in the length of a command RIGHT$ in my QB64 program. It affects only the allhosts list. Thank you for the feedback. The ipleak.net site ends up at a Digital Ocean IP address so I will look into that. The spotify problem is work in progress, I still have ads. I don’t know why gearbest is blocked but it should be whitelisted as well. Thats been unlisted it was in both of the blocklists. 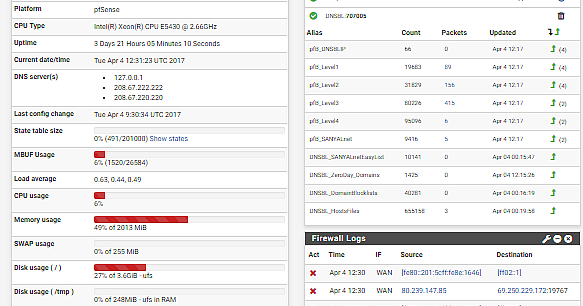 Hand-compiled working list of IP address and DNS blocklists for use with pfBlockerNG on pfSense firewall router. It contains a bunch of malware, ad, coin, and tracking domains. I found that if I use all of these lists independently, my pi-hole box stops blocking ads, not sure if this is due to an upper limit (approx 1.3M sites) or something else. @mildocjr The lists do contain a lots of IP addresses and the Pi-hole only blocks domains so you would see ads if you ran them independently. Looks like appleid.apple.com is also blocked? @ajp2k13 Are you using the 1 million or the 4 million BlockLists? I am unable to test Ithings I dont own any. 1 million, I whitelisted it myself because I couln’t login and check my Apple-ID. Not sure if there are more because my Apple TV acted a bit weird as well but it could have been something else I guess. @ajp2k13 If you could share you findings on your Apple TV in your time I will look into is. @smokingwheels I actually reinstalled my Pihole recently but I will add your list again shortly and check my Apple TV, thanks! My hardware resolution is not high enough to actually test. 4 billion blocked domains… quite a lot. have you thought about verifying if all the domains really exist? or have you already checked the existence? If you wanted to test them all with a wget operation, I would be interested in the results.